“I would not want to teach distance without the proctoring services provided by the Testing Center,” said John Russ, undergraduate coordinator in the Agricultural and Resource Economics Department. Russ is just one of many NC State faculty members who utilize DELTA Testing Services for a secure testing environment for their online and distance education students. In the 2015-2016 fiscal year, DELTA Testing Services underwent many changes. The biggest change in September 2015 was the physical relocation of the Centennial Test Center from Venture II to Venture IV to better accommodate students. Among noteworthy events for DELTA Testing Services was earning Test Center Certification and receipt of a grant from the National College Testing Association (NCTA). This is not the first time DELTA Testing Services has expanded. In 2011, Cox Hall Test Center on Main Campus opened providing an additional 37 seats to Venture II’s 42 seats. DELTA Testing Services spent eight years in Venture II before moving to Venture IV in 2015. 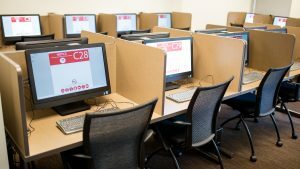 The move was necessary due to the 20 percent annual increase in student enrollments and the 67 percent increase in exams administered over the past several years. DELTA Testing Services simply outgrew its space. Associate Director of Online and Distance Education Administrative Services Sharon Broere said, “Our space has been great during the regular semester.” However, she further explained that during the week of final exams, the number of students visiting the testing center and the time they spent there overwhelmingly increased which caused long wait times. To ease the wait times at the two main locations, overflow sites were used to accommodate students. Overflow locations are still used today to better serve students. In addition, to inform students of potentially long wait times, DELTA staff created WaitTime in Spring 2013. The WaitTime web application shows students how long the wait may be before they can sit for their test. WaitTime is still in use and is a great tool for students. A long-term solution to the exponential growth of students using the Centennial Campus Test Center was to move to another location. The new space in Venture IV has 108 seats and four individual testing spaces to accommodate Disability Services. Between the two locations, DELTA Testing Services now has a total of 144 seats and five individual rooms. With the additional space, beginning Fall 2015, Testing Services partnered with the Disability Services Office to assist with on-campus accommodated testing. Many students like the new location and the clear layout of the space, including larger desks and extended testing hours. Previously, the Centennial Campus location was only open two nights a week. It now stays open four nights a week with 7 p.m. being the last sign in time. The DELTA IT staff provided technology and set-up assistance to Testing Services for an easy transition. Although the move went smoothly, informing students proved a little more challenging. Shortly after the move on Centennial, the testing center at Cox Hall temporarily closed in October 2015 due to noise issues from the renovations around Cox Hall, according to Broere. To help spread the word about these changes, DELTA Testing Services, with permission from professors, added a block of information to class Moodle pages beginning in Spring 2016. The block gave students a direct link to the DELTA Testing Services website and an easy way to access news and announcements regarding testing. Another part of the communication strategy was to pilot the Remind.com text messaging system for DELTA Testing Services to send important updates. Another exciting change came when DELTA Testing Services received Test Center Certification from NCTA in March of 2016. According to Broere, the certification gives Testing Services more credibility among faculty. “We’re following a certain set of guidelines that are approved on a national level,” she said. The guidelines include the space of the testing centers, staff training, managing paper tests and test information, managing students and customer service. “Overall, the faculty trust us to make good and proper decisions as far as exam integrity,” Broere said. In addition, DELTA Testing Services staff received a national grant from NCTA used for team building, strategic planning and professional development. Broere said she applied for the grant to provide the staff the opportunity to engage with one another outside of the office and to help build the relationships among colleagues. DELTA Testing Services continues to receive positive feedback from faculty. “The DELTA Testing center gives me peace of mind that a secure testing environment is available with the added benefit of flexibility for the students and faculty,” said Melissa Hart, lecturer in Poole College of Management. She also mentioned being able to focus on engaging students and refining her course rather than stopping the flow of learning for testing. Despite all of the changes made in 2015-2016, DELTA Testing Services continues to provide quality testing services to online and distance education students. With the addition of the NCTA Certification, the testing center maintains its reputation of integrity and commitment to providing the best service possible.